Natural things add a touch of warmth to homes but the problem with things from nature is that they tend not to be as permanent as we like. 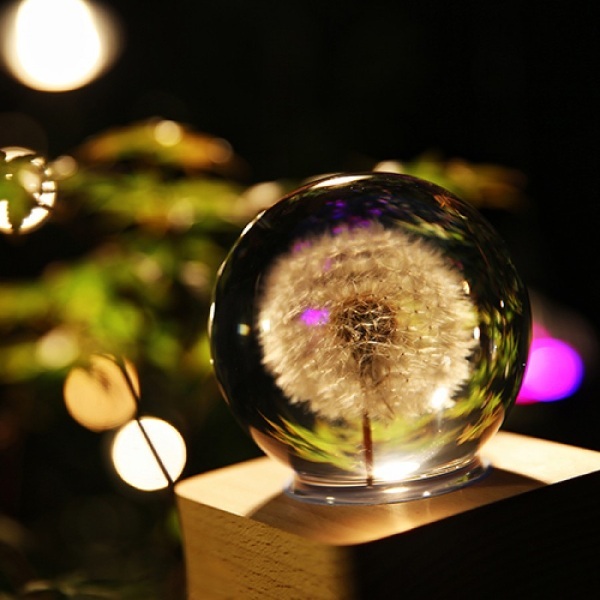 No worries with the Dandelion Mood Light, this beautiful puff of wishes will never, ever blow away. This mood light is small, which makes sense because it’s a real dandelion puff, trapped in clear resin. I wish there was a video showing the process for creating these things because that has got to be hard to pull off. Dandelion puffs are fragile. The puff sits on a wooden stand and is illuminated by a soft glow. It is not suitable for actual lighting, way too small and soft, but it makes a nice mood or nightlight. Perfect for bedrooms or desks. An interesting concept but maybe not that interesting for the price. This little ball of hopes and dreams will run you $279.